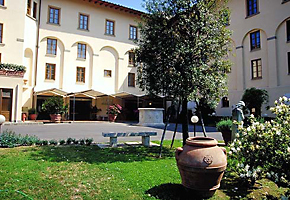 Polihotels Villa D'Annunzio, a new and prestigious receptive-structure, is placed in a suggestive site in Florence, amongst lots of green, a few minutes from the city center. It is in an ideal position to visit monuments and museums of the city and its wonderful surroundings, like the historical Fiesole, from whose hills an incomparable view can be enjoyed. 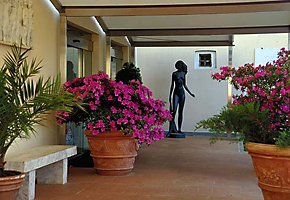 Inside the building and in the garden of the hotel, you can find numerous paintings and sculptures, fruits of a real passion for art of the property association partners of the hotel have constituted a very real collection. 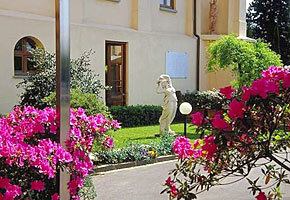 The hotel is located at the foot of the hill of "Fiesole" in Florence, a few minutes from centre of Florence, in a suggestive atmosphere amongst lots of green. 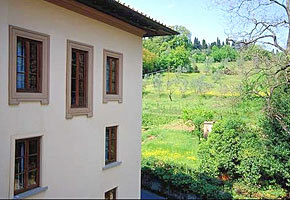 Quiet and relaxing location allows its guest to quickly reach Florence downtown or climb the gentle hills of Fiesole, from which a breathtaking view over Florence may be enjoyed. From the hotel, thanks to its excellent connection to the historical center of Florence, in only a few minutes it is possible to reach the area with the most beautiful shops of the city, where you can find all the labels that have made Italian fashion famous worldwide. For the more wanting client, there is the possibility to easily reach, by car, taxi or public transit, the "Valdarno" zone where you can find outlet shops of the most famous design houses such as D&G, Prada, etc. The hotel features 80 rooms. 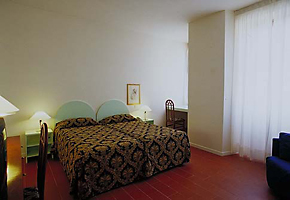 The rooms are decorated with a tasteful simplicity and elegance, all furnished with a mini-bar, air conditioning, satellite TV and internet connections. 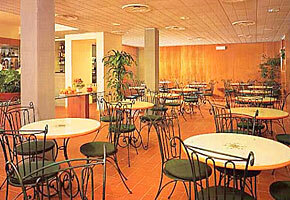 All rooms were thought to satisfy the most demanding clients. A young, professional staff is ready to welcome you to the Hotel. 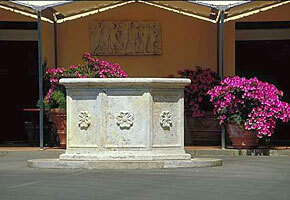 At the reception desk it is possible to make reservations for a visit to museums or at a good restaurant where one can find an excellent Tuscany cuisine. For the famous "Chianti Area", not far from Florence, it is possible to reserve a guided tour with wine tasting of Chianti wines DOCG. Restaurant - The choice to not have a restaurant in the hotel is due also to the fact that nearby you can find some of the best restaurants in Florence, famous for their traditional cuisine, paying attention to the most minor details. 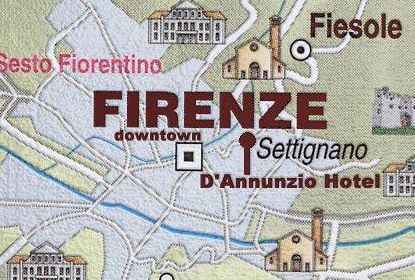 Some of these Florence Restaurants use the names of some of the most famous works by the poet Gabriele D'Annunzio, to which the hotel itself takes its name, like "Il Piacere" and "La Capponcina". 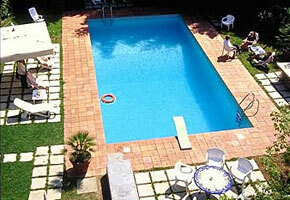 Swimmingpool - Polihotels Villa D'Annunzio is one of the very few Hotels in Florence which offers this extra service. 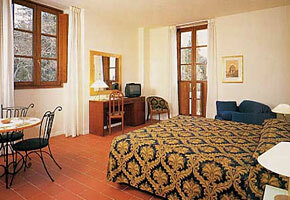 Moreover, the Hotel offers the possibility to go running or other open air sports. 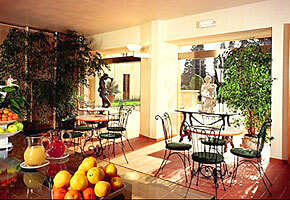 Gests can enjoy drink at the well stocked hotel bar or on the veranda on the garden. Free Services - welcome drink; - 1 child up to 12 sharing the room with two adults, free; - facilities for the purchase of museum, cinema and exhibition tickets; - private car parking free of charge. VAT and breakfast are included in the rate. 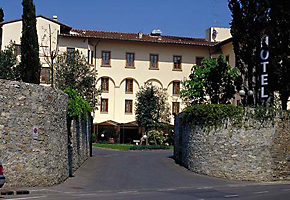 The D'Annunzio Hotel Florence is ideally located between Florence dowtown and the historical Fiesole, a beautiful Florence township just a few miles from Florence center.